In the recent years, the bacteriolytic therapy “box” has been opened again with very relevant outcomes. One such example is Clostridium novyi based therapy. More specifically, it has been recently shown that Clostridium novyi-NT (an attenuated C. novyi strain by removal of the α-toxin gene) destroys the hypoxic and necrotic parts of tumors, which are traditionally resistant to radiation and cytotoxic agents. Although clostridia are strictly anaerobic, most of them can form spores allowing survival but not growth in oxygen reach conditions. Indeed, certain types of bacteria grow only in low oxygen or anaerobic conditions. Thus, Species of Clostridium bacteria are notable for their ability to lyse tumor cells growing in hypoxic environments. Once administered, C. novyi-NT spores germinate locally within tumors and precisely spread throughout the tumor, causing hemorrhagic necrosis, tumor cell lysis and tumor regression. Well-vascularized tumor rim is more resistant to C. novyi-NT. On this line, I would expect that C. novyi-NT toghether with angiogenesis inhibitors should be a perfect match. Recently, Clostridium novyi-NT has been used for the first time to treat a human patient. This treatment reduced the tumor within and surrounding the bone. (Ref.) Following that, clinical trials have been initiated (see below). 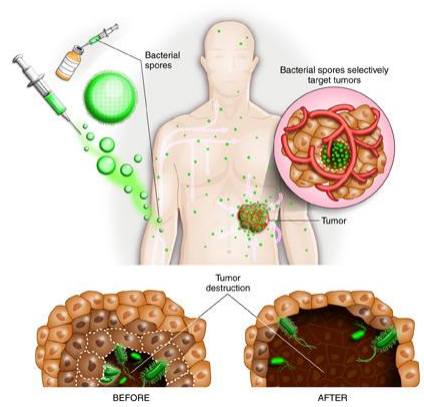 One problem of the systemic spore administration is the contrast between the need for a large injected spore dose and the relatively small fraction of spores that can reach the tumors. This limits the efficacy of the therapy and potentially creates side effects, particularly in large animals and human patients that have relatively large blood volumes. In contrast, Intra Tumor spore administration can theoretically deliver orders of magnitude more spores directly into the tumor. As a result, Intra Tumor administration is the preferred route of administration. The clostridia used in the field of cancer treatment are sensitive to a wide range of antibiotics, allowing tight control over their presence at all times. Background: Intratumoral injection of Clostridium novyi-NT (attenuated strain of Clostridium) induced a microscopically precise, tumor-localized response in a rat orthotopic brain tumor model and in companion dogs bearing spontaneous solid tumors. Furthermore, intratumoral injection can plausibly induce an immune mediated abscopal effect in non-injected tumor sites. Methods: A standard 3 + 3 dose escalation Phase 1 study of a single intratumoral injection of C.novyi-NT was designed to determine the DLTs, MTD and preliminary activity in adult patients with advanced cancers and superficially located tumors (1-12 cm in size). The SOFA score and temperature are used to guide antibiotic usage. Results: To date, a total of 5 patients (women, n = 3; men, n = 2) with advanced sarcomas (leiomyosarcoma, n = 2; chondrosarcoma, n = 1; carcinosarcoma, n = 1; angiosarcoma, n = 1), median age 54 years, have received an intratumoral injection of 1 x104 (n = 3) and 3 x104 spores (n = 2). Evidence of germination has been noted in 3 patients and has consisted of pain in the injected tumor, fever, elevated WBC with a left shift, an elevated C-reactive protein, and necrosis and gas pockets in the injected tumor on radiographic imaging. Treatment-related grade 3 adverse events include leukocytosis, pathologic fracture, pain and respiratory insufficiency. The most significant morbidity was observed in a patient with a large volume of tumor destruction leading to a pathologic fracture of the necrotic right proximal humerus, which required an aggressive orthopedic surgical procedure. Of note histopathology demonstrated extensive tumor necrosis with small foci of residual tumor cells during surgery. Two patients had between 22-24% shrinkage in the injected tumor and an overall response of stable disease at 2 months. Because exploratory cytokine analysis suggests the potential for a systemic response and because abscopal responses were seen in the companion dog studies, the clinical protocol has been amended to include biopsies of both injected and non-injected tumors pre and post C.novyi-NT injection. Conclusions: Intratumoral injection of Clostridium novyi-NT is feasible and has lead to significant destruction of injected tumor masses in the first two doses studied. Purpose: Hypoxic environments, as occurs in tumors, are favorable for Clostridium subspecies to germinate. Clostridium novyi-NT (C. novyi-NT) induces a microscopic & tumor-confined lysis after intratumoral (IT) injection in rat orthotopic brain tumor models & spontaneous solid tumors in dogs, with the commonest toxicity being the traditional accompanying symptoms of bacterial infections. A first-in-man phase 1 study selecting therapy-refractory solid tumors palpable or identifiable under imaging guidance and amenable to percutaneous injection of C. novyi-NT spores is being conducted. Tumor environment hypoxia is dynamic, spatially heterogenic, and not evaluable using clinical imaging technology, thereby rendering a priori localization of the optimal IT location for spore inoculation impossible. In order to compensate for this unknown parameter, we employed a staged, multifocal IT delivery process to theoretically increase the likelihood of spore deposition within a milieu conducive for germination. We present our initial experience with C. novyi-NT spore delivery adopting this approach. Material and Methods: Advanced solid tumor cancer patients with at least 1 injectable tumor >1 cm are being enrolled in 5 dose-escalating cohorts to receive single 3-cc IT injections of 1E4, 3E4, 1E5, 3E5, or 1E6 C. novyi-NT spores. Results: Four patients have been treated (3 in cohort 1, 1 in cohort 2). Median tumor diameter measured at point of guide needle access was 5.4 cm (2.3-8.9 cm). Sites included intermuscular upper extremity and subcutaneous fat abdominal lesion (2 each), which were uneventful; in toto delivery of the agent was accomplished. Two patients demonstrated clinical evidence of germination within 72 hours corroborated by imaging. Pathology confirmed oncolysis. The liquefied components of the tumor were managed with evacuation via percutaneous drainage and pre-specified protocol-mandated multi-antimicrobial therapy. Conclusions: Clostridium novyi-NT spores can be delivered using existing imaging technologies and devices producing clinical evidence of germination and confirming the capability of inducing oncolysis in human neoplastic tissues. Dose: According to the above clinical trial: The first cohort dose will begin at 1 x 10(4) spores/kg and will escalate by tripling through 5 cohorts up to 100 x 10(4) spores/kg. So far, the only source seems to be the clinical trial itself, but I will investigate more to see if there is any private clinic offering it or other “unconventional” sources. 2015: Clostridium to treat cancer: dream or reality? Abstract: In their paper “Intratumoral injection of Clostridium novyi-NT spores induces antitumor responses”, Roberts et al. describe the induction of antitumor responses following local spore administration of an attenuated C. novyi strain (C. novyi-NT). Stereotactic intratumoral spore injection led to significant survival advantages in a murine orthotopic brain model and local bacterial treatment produced robust responses in a set of spontaneous canine soft tissue carcinomas. Their preclinical findings in both models, provided the basis for a phase 1 investigational clinical study in patients with solid tumors that were either refractory to standard treatment or without an available standard treatment available (NCT01924689). The results of the first patient enrolled in this trial, a 53-year-old female with a retroperitoneal leiomyosarcoma, are described. Next to the non-armed C. novyi-NT described in this paper, very potent genetically modified Clostridium expressing anti-cancer therapeutic genes are also being developed. Are treatments with these non-pathogenic clostridia a viable alternative cancer treatment? Cancer is a disease with a high incidence in the western world and worldwide cancer burden continues to increase. Although the use of standard treatment modalities results in ~50% cure of cancer patients, failure to control the tumor locally and metastasis result in lack of treatment efficacy in the other 50%. Conventional treatment is unsatisfactory for many patients bearing large non-resectable locally advanced tumors. To increase treatment potential, substantial resources must be devoted to discovery and development of novel anti-cancer therapies. When doing so, it is important to recognize both the factors that distinguish a tumor from its surrounding normal tissue as well as the factors that limit successful therapy with available treatments. Tumor hypoxia is a good example (1). The majority of solid tumors in patients have shown, irrespective of their size, to contain hypoxic and/or necrotic regions (2). This arises due to the chaotic organization and irregularity of blood vessels, which prevent sufficient delivery of oxygen, nutrients and therapeutic agents to all cells within the tumor (3). Furthermore, hypoxic tumor cells are more resistant to ionizing radiation and anti-proliferative drugs. A variety of therapeutic approaches have been designed to overcome this source of resistance. These primarily include strategies that aim to decrease hypoxia by increasing oxygen availability [e.g., high oxygen gas breathing (4)], or strategies aimed at preferentially killing this resistant cell population [e.g., by using bioreductive drugs (5)]. Alternatively, as hypoxia/necrosis is highly specific for tumors, it also represents a unique environment not found elsewhere in the body. Furthermore, tumor necrosis is not only commonly found in most solid cancers, it is also strongly associated with poor prognosis (6) and currently no therapeutic agents are available that “use” tumor necrosis to specifically target the tumor. Yet, this necrotic niche is the ideal environment for growth of strictly anaerobic bacteria. Although maybe rather out of the common at first sight, the deliberate administration of anaerobic bacteria in cancer has a longstanding history [for a review, see e.g., (7)]. Amongst the different species of prokaryotic species used for this purpose, the Clostridium genus has been most widely studied. 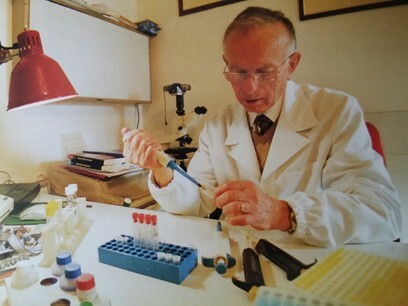 Much of the current interest in Clostridium-mediated anti-cancer treatment originates from the initial studies of M. Brown and colleagues about two decades ago (8). As a group, Clostridium has probably achieved greatest prominence as a consequence of their more notorious representatives, such as C. botulinum or C. tetani. Although clostridia are strictly anaerobic, most of them can form spores allowing survival but not growth in oxic conditions. These spores only germinate into metabolically active cells when conditions are favorable (as in wounds or spoiled meat). Most members of the genus are, however, non-pathogenic. Moreover, and paradoxically, it is the very ability to form spores that presents this genus with its potential for treating cancer. In addition, the clostridia used in the field of cancer treatment are sensitive to a wide range of antibiotics, allowing tight control over their presence at all times. In their paper, Roberts et al. (9) use C. novyi-NT, an attenuated derivative of the wild type strain by removal of the α-toxin gene. C. novyi-NT has been shown in preclinical settings to have excellent tumor colonizing properties. Also C. sporogenes (10) and C. perfringens (11) have been shown to possess this characteristic and it represents probably one of the most important strain-specific requirements if to be supplied to patients. Indeed, a tumor can only be taken down when sufficient artillery (active vegetative bacterial cells) can be activated at the crime scene (the hypoxic/necrotic tumor area). To increase the chance for successful application of their Clostridium-mediated anti-tumor approach, the authors choose for local intratumoral spore administration, arguing that low colonization might take place when administering the spores in large animals and human patients intravenously due to the relatively large blood volumes and relatively small tumors as compared to murine models. This is a valid argument, yet limits the applicability as only tumors amendable to percutaneous injection of spores can be included. Several alternatives exist to overcome this issue. One approach to significantly increase colonization efficiency may be to increase the level of necrosis in tumors by application of vascular targeting agents (12). Another approach is to increase the potency of the clostridial vector itself. Roberts et al. use non-armed C. novyi-NT bacteria, and it is the specific proteolytic nature of the strain that, once germinated, induces tumor necrosis. Strains such as C. sporogenes also have inherent anti-tumor effects as a consequence of proteolysis, but to a lesser extent, and significant efficacy improvement can be obtained by arming these bugs with additional therapeutic genes. The development of a method that allows stable integration of a foreign gene in the clostridial genome without the need for antibiotics, as described by Heap et al. (13) represented a major breakthrough in this context. It is now possible to integrate virtually any gene of interest within the chromosome, thereby minimizing risk of loss due to segregational instability or horizontal transfer when using autonomous plasmids. Obviously, for a clinical trial to be allowed when incorporating a foreign gene, stable integration is an absolute requirement from a regulatory point of view. In principle, any gene of choice can now be added to the clostridial vector. The wide potential is exemplified by the incorporation of even a single chain antibody into both C. novyi-NT and C. sporogenes (14), pointing towards possibilities for combining antibody- and clostridial based approaches in one and the same treatment. Most studies with armed clostridia have however been performed with so-called prodrug converting enzymes (PCE). Such PCE can convert a non-toxic prodrug into a chemotherapeutic agent. Since the PCE is only expressed within the tumor where clostridia reside, the conversion also only takes place locally within the tumor, thereby avoiding the side effects commonly occurring following systemic therapy. In addition, most of these prodrug/PCE combinations are characterized by a potent bystander effect as the converted prodrug can diffuse from the site of conversion towards non-exposed neighbouring cells within its vicinity. The proof-of-principle of this approach has been shown with PCE expressed from a plasmid (10,15) and more importantly, recently also with a nitroreductase PCE stably integrated into the chromosome (16). Clearly, clostridial-directed enzyme prodrug therapy (CDEPT) can thus create enormous efficacy amplification with the potential to overcome the limited efficacy of non-armed clostridia in case limited colonization should occur. Then again, the patient described in the paper has excellent colonization of the tumor although only 1×104 C. novyi-NT spores were administered, a dose several orders of magnitude lower than described in most preclinical studies, indicating that colonization in human tumors even when spores were to be administered systemically will not be a major obstacle for success. The authors of this paper convincingly show the importance of using the appropriate models. They start with an orthotopically implanted syngeneic rat glioma, a very aggressive and most difficult to treat tumor. Response to bacterial treatment was remarkably fast and tumor-tissue specific and one spore administration resulted in significant survival advantage with medically manageable edema as mostly occurring side effect. Probably even more impressive are the data generated with spontaneous canine soft tissue carcinomas. These tumors not only resemble the histopathological features of human soft tissue carcinomas, the authors also extensively show that the genetic landscapes of these tumors in terms of numbers of genetic alterations and spectrum of mutations are similar. A large comparative study including 16 dogs with spontaneously occurring tumors receiving 1 to 4 cycles of bacterial spore treatment is described. Responses vary from progressive disease (no response) to complete response. Adverse events were in general mild and the majority of animals showed clinical signs of inflammatory response, providing clear evidence of an innate immune response and an indication of tumor colonization by the administered bacteria. Most dogs also developed abscess formation, probably a consequence of the rather aggressive tumor colonization and necrosis-inducing characteristics of C. novyi-NT. Although abscess formation was not always observed and also not necessarily linked to objective response, the requirement for surgical management and wound debridement does negatively influence the risk/benefit analysis and should be carefully looked after in future trials. Nevertheless, all together the described preclinical data in both rats and dogs are very promising and do warrant use of bacterial administration in humans. Treatment of one patient is described, and although of course way too early to draw any conclusion with regards to safety, tolerability or response rate, the observed response in this patient together with the manageable side effects show great promise for what yet has to come. For sure, the combination especially with proper selection and highly specific local treatments such as radiotherapy can be expected to increase efficacy further. In that respect, recent technical developments now allow highly precise radiation treatment planning also in animals through the use of dedicated innovative small animal radiation machines making appropriate preclinical testing of such combinations in relevant preclinical models possible (17). In summary, Roberts et al. have provided very promising data on the use of Clostridium to join the fight in the battle against cancer. Other options along this line, including proper patient selection with imaging (18), systemic injection of spores and different Clostridium strains armed with therapeutic genes are also on the way (16). With these promising data and with many of the obstacles related to this novel and rather uncommon approach being solved over the last years, we believe that the uncomfortable feeling that might exist in patients’ and medical doctors’ heads when deliberately administering bacteria may disappear. As more patients will be evaluated in future trials and as various approaches with different strains will be tested, we are hopeful that the full potential of Clostridium-mediated anti-cancer treatment will become clear and that much more than a dream, this treatment will become reality. I haven’t found any center doing this therapy but also probably did not investigated deep enough. If you find anything relevant please let me know Marc. Where would one obtain this bacteria? What about rigvir?